This must be one of the weirder merchandise illustrations I've seen in a while... but somehow it still has a cool vibe to it. Up for sale on Ebay (directly from Greece) is this Greek edition of an Inspector Gadget board game that was released in the 80s. They get a lot of strange touches into this cover drawing: All of Gadget's clothing has the wrong colors (except for the pants), Penny's eyes look REALLY freaky (and dead)... and then you have M.A.D. 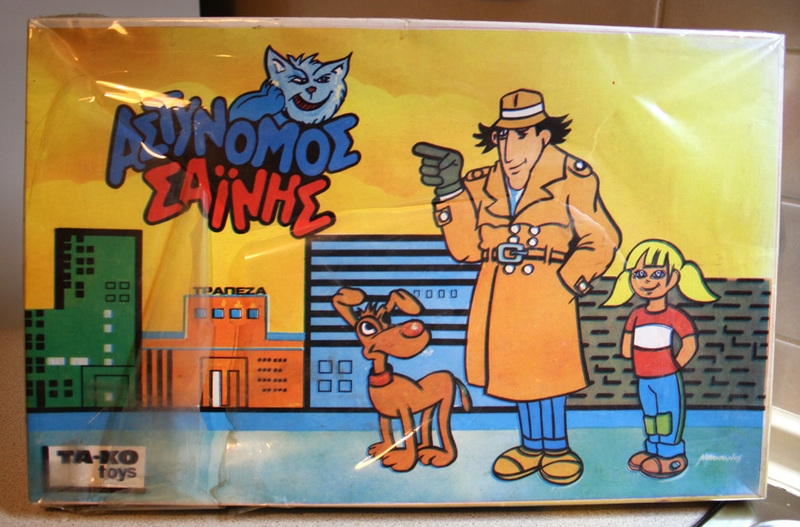 Cat, who's actually integrated into the Greek Inspector Gadget logo, from which he pops out and grins at our heroes like the Chechire Cat from "Alice in Wonderland". (Is M.A.D. Cat a fan, I wonder?) Gadget even points at him with a playful smile... now what the heck is THAT supposed to mean? Of course, he probably doesn't know that M.A.D. Cat belongs to Dr. Claw, but I almost get the feeling that he's saying: "You rascal, you... sitting on top of my logo like that!" Hey, you wouldn't happen to have links to where I can watch those episodes you recoomended a while back? Sure! I assume you're talking about season 2, right? There hasn't been too many official releases of those episodes yet, which is probably why old VHS and television rips are all you'll find online at the moment (unless you have access to official streaming video services such as Netflix and Amazon Instant Video). But if you just wanna watch the episodes, I can recommend this channel on a Romanian streaming site: http://www.peteava.ro/canal-160. Press "Sezonul 2", and you'll find almost all episodes from season 2 in generally decent quality. (The only things missing are three safety tips from the episodes Gadget's Gadgets, Gadget and Old Lace and Gadget and the Red Rose; as well as the entire episode Gadget Meeets the Grappler.) Beware of The Incredible Shrinking Gadget, by the way: In addition to Capeman, this verson of the ep has really bad sound!